Come as you are, stay as long as you like, or as little as you like. The only thing we ask is that you are respectful of other parishoners and attendees and keep noise to a minimum while liturgy is undertaken. You can will find a short introduction about church etiquette in the following parts. Also, if this is your first time in a liturgical and sacramental church, the seeming complexity of the liturgy can sometimes be intimidating or confusing – but we’re here to help. If you have questions about the liturgy, Gnosticism, or the Apostolic Johannite Church as a whole, please ask away. You can write to us, call ahead of time, or join us for coffee afterwards – questioning is, after all, the beginning of wisdom. If we don’t know the answer, you can be sure we’ll say so. Ideas are often best explored with other minds and thoughts, and we’d be pleased to help you, if we can. Many people, on their first visit to a church, are a little worried about how to behave. This page is a short guide to some of our common customs intended to reduce anxiety in new visitors. Because most chapels we celebrate our liturgy lack kneelers, we don’t kneel as a general rule. For most of the service the celebrant will invite you to stand or sit at the appropriate time. Before the start of the service, you should sit (or if you prefer kneel) to meditate or pray quietly. At the beginning of the service as the celebrant enters, the people stand to mark the beginning of the service. At the end of the service, as the celebrant moves to the front of the altar to depart, the people stand to mark the end of the service. Typically, in our Missal, you’ll find a little cross sign (+) that signifies you where you may make the sign of the cross. Many churches restrict who is able to share in the bread and wine at a Communion or Eucharistic service. The AJC welcomes anyone who wishes to join us in communion to share. Common practice is to kneel to receive communion. Because our chapel has no communion rail or kneelers, this is a challenge, so the people usually receive communion standing. 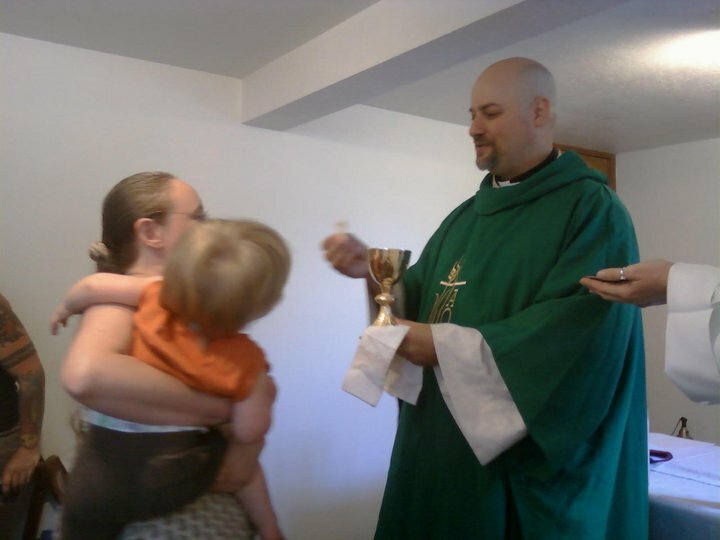 The priest will bring the consecrated host and the cup (or chalice) to you where you are standing. If you have no fear of hard floors and you’d prefer to kneel, feel perfectly free to do so. First, the priest will offer you the consecrated host. Standing in front of you, she or he will hold it before you and say, “Be what you see, receive what you are.” You should respond, “Amen,” and then open your mouth or hold out your hands. The priest will place the bread on your tongue or in your hands, and you consume the host. After you receive the bread, proceed to the cleric holding the cup. Just as before she or he will hold it before you with the words, “Be what you see, receive what you are.” You should respond, “Amen.” The cleric will then hold the cup to your lips. If you are kneeling, allow the cleric to tilt the cup until you can take a small sip of the consecrated wine. If you are standing, it is very difficult for the cleric to tell when you have received the consecrated wine, so gently hold the base of the cup and assist with tilting it until you take a sip. Once you have received communion in both kinds, feel free to either kneel or sit and pray or meditate on the gifts of the Eucharist. Now that You Know, Welcome to Our Community! The celebration of liturgy is an occasion for joy because we draw closer together as a community, we draw a little closer to the Divine and we offer ourselves as agents for the ongoing life of the world. If you’re unfamiliar with attending services, all these guidelines might seem a little overwhelming, but don’t worry – it’s not hard to follow and there are people here to help. The important thing is being open to the mystery of liturgy and present to the other human people working with you. If you can do that, everything else falls into place. Welcome to the Rose Cross Community!